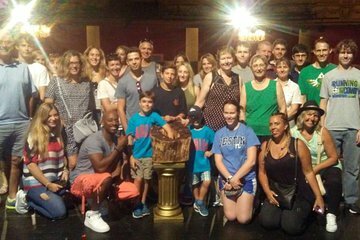 Explore Harlem on foot as you absorb the history of its music, legendary entertainers, and the heyday of the Apollo Theater on a 3-hour walking tour. In addition to discovering the neighborhood and its history, you'll get a chance to stand on the same stage as musical geniuses such as James Brown and Ella Fitzgerald, and go backstage for a mock 'Amateur Night at the Apollo' performance. Start at the Schomburg Center for Research in Black Culture at 1pm. Enjoy a multimedia presentation about Harlem—usually Schomburg exhibits are about the musical culture of Harlem, but content can vary. After the presentation, walk along the streets of the New York neighborhood as your guide stops you at important sights where major historical events happened, with special attention on Harlem's musical history. Pictures and videos will be shown at some stops as part of the experience. End the tour by going back-stage at the world-famous Apollo Theater, the venue where many Harlem musicians were launched into stardom. Take part in a mock Amateur Night at the Apollo performance where you can stand on the same stage as musical legends such as James Brown, Ella Fitzgerald, and Michael Jackson.